Today is a holiday where I live. Its official title is “Family Day”, but I prefer to think of it as “It’s bloody cold outside, let’s have a holiday Day”. And true to its word, it’s cold – and therefore a perfect day to spend in the room next to the furnace. That’s the layout room, of course. I started by organizing my scenery supplies, which have drifted into chaos of late. Grass supplies in several spots – same thing with ballasts and other ground cover materials, tree and shrub materials, and scenic details. It didn’t take long to get things in order – and realize that the best place for all of this scenery material is on the layout. After all, that’s why I bought it! So (as the title of this post suggests) I spent a couple of hours planting weeds and bushes. I decided to focus on the area around the elevated Coal Track in Port Rowan, since I’ve never really liked the look of the grass on the elevated track. Not too inspiring, is it! 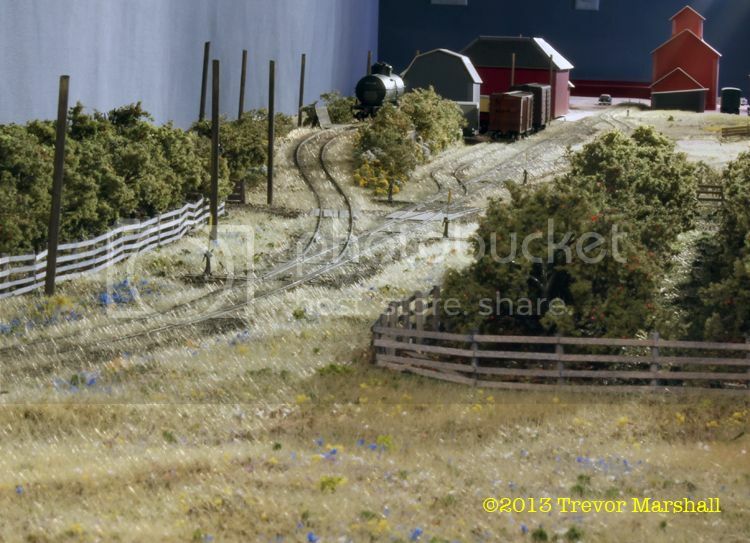 I have a lot more scenery material, and I plan to add more weeds and bushes to the meadow between yard and fascia (although not as thick as I did on the coal track, since people will be reaching over the meadow frequently during an operating session). But that’s for another day. For now, I think today’s work turned out quite well! 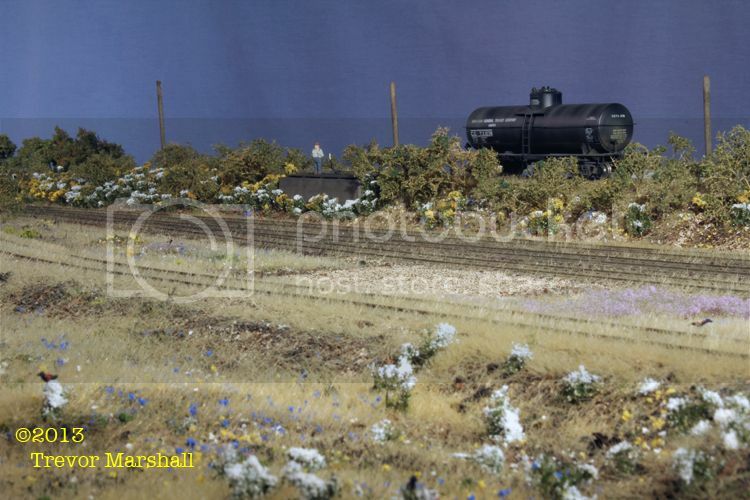 This entry was posted in figures vehicles and other details, grass, weeds and bushes, Port Rowan coal dealer, scenery, structures by Trevor. Bookmark the permalink. Thank you, Bruce! More to do – always – but it’s a start. Looks great, I love how you’ve worked the fall asters and the golden into the ramp. Very realistic looking! It’s actually more than what was on the prototype – which had grass, mostly. But I didn’t like my grass or that long, featureless berm. I like this better. I like that a lot! Some nice different colors and different textures, that all blend together into a nice looking scene. 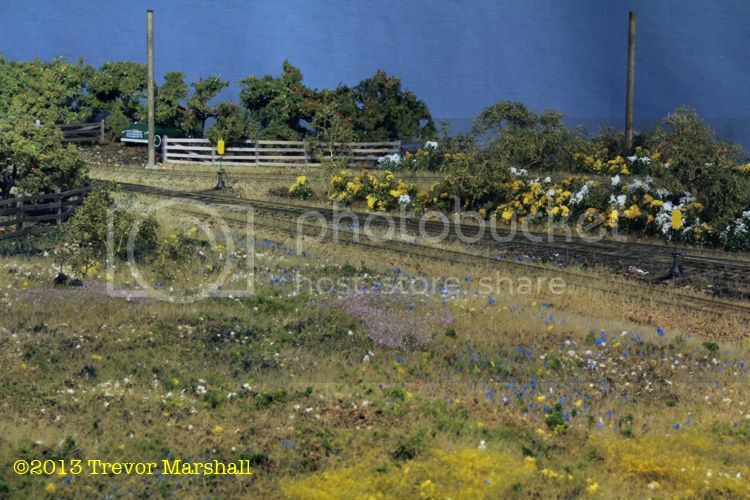 Are the flowers White Baby’s Breath and Yellow Buttercups? 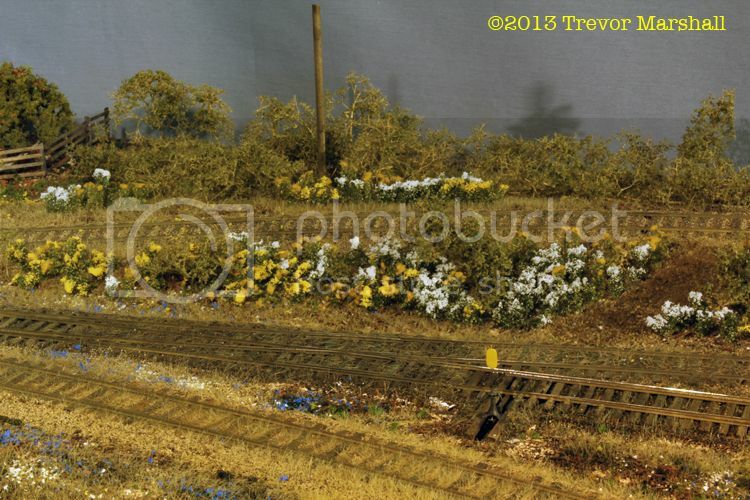 I’ve never put flowers on my layout, but they sure add a lot to your area. Thanks for the kind words – and yes, they are the Silflor Baby’s Breath (or “Babys Breathe” as it says on my packages) and Buttercup. I’ve also added some Goldenrod. 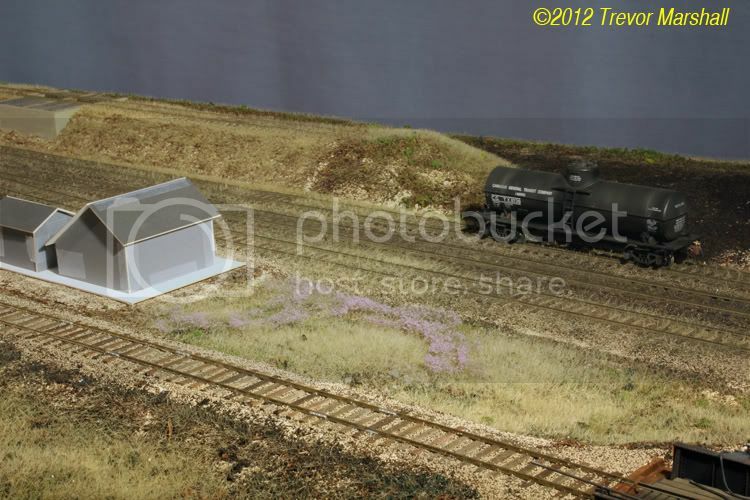 More to come – I like adding weeds and bushes to the layout. I think they really bring the scene to life. Thanks for the reply. 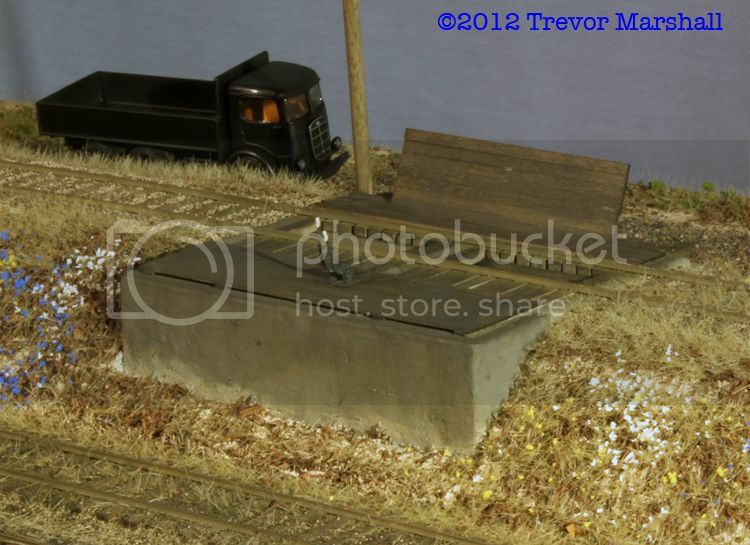 They do add a lot of life to the layout and some much needed natural color. We always have a lot of greens and then there are the black engines and the drab colors on the cars too. You’re welcome – and you’re right: they do add a much-needed injection of colour.